Summer can be a mixed bag, a combination of relief from the stress of school, followed by boredom, the bugaboo of a creative mind. The break from school offers a chance to carve out enriching, fun projects and beat the doldrums brought about by summer loafing. The warm weather is a great invitation to enjoy and learn about the outdoors during this time off. Here are 10 learning opportunities for kids to come away from the summer months invigorated with fresh skills. 1. EMBARK ON BIRDWATCHING ADVENTURES. Local chapters of the Audubon Society host birdwatching outings, where those new to birding can benefit from the expertise of the pros. Kids can learn about the local ecosystem, as well as wildlife adaptability and habitat preservation. If birding catches their fancy, they can keep the adventures going with YardMap, a citizen science project designed to cultivate a richer understanding of bird habitat. The YardMap network lets you draw your landscapes with a beautiful online mapping tool and connect to other citizen scientists, solve problems, share maps and ideas, all while helping to build database of habitat data for Cornell Lab of Ornithology Scientists. 2. GO ON A HIGH-TECH TREASURE HUNT. 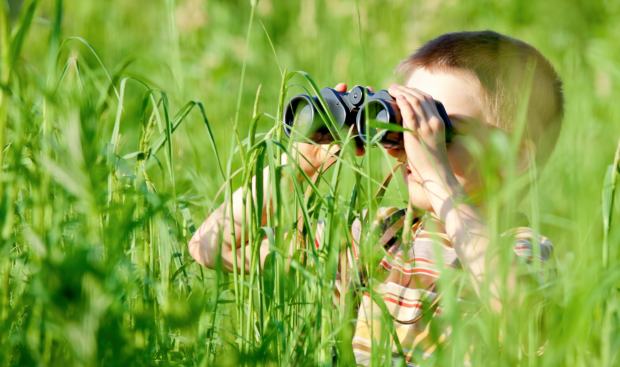 With a GPS device and coordinates from geocache.com, kids can participate in a scavenger hunt and look for one of a million treasure spots around the world. If they find the cache or hidden treasure, they can re-hide it in the same place or stash their own goodies in a hidden spot. The best part is logging the finds and sharing their experiences on the site. 3. HANG A ROPE SWING. With about 10 feet of rope and a buntline hitch knot, it's easy to build a tree swing. Kids can learn knotting and building skills and do the math to determine attachment points and rope lengths. If the backyard won't work, there's always the nearest park. 4. FARM THE BACKYARD. Anyone with any amount of space can grow food. Whether it's starting a small herb garden on the fire escape or building raised beds in the backyard, the process of growing food allows kids to develop an understanding about our food sources, nutrition, how irrigation works, even the importance of supporting local growers. Plus, they'll benefit from having the responsibility of taking charge of their own important project. 5. MAP THE RED PLANET. Kids can help scientists improve maps of Mars and participate in other research tasks to aid NASA in managing the large amount of data from the Red Planet. Users create Martian profiles and become "citizens" of the planet. In the map room, they can then earn Martian credits by helping place satellite photos on Mars’s surface, counting craters, and even helping the rovers Spirit and Opportunity by tagging photos with descriptions. 6. PERFECT THE AIM. Nothing enhances visual acuity and predictive ability like target practice. Archery clubs can be found in most cities and welcome all ages (grade school) and skill levels. Start by attending a tournament or taking a lesson at an archery range. 7. ACTIVELY LISTEN. The Acoustics Research Centre at the University of Salford is building a sound map of the world as part of a new study into how sounds in our everyday environment make us feel. Kids can use a mobile phone to record 10 to 15 second clips from different soundscapes, upload the clips to our virtual map, along with opinions and ideas about the recorded sounds. 8. ORGANIZE A RECYCLING PROGRAM. Kids can learn about leading a recycling project by organizing a group of young recyclers. Local recycling centers, municipality and waste haulers often list the types of materials that are accepted. Apart from learning about sustainability and limited resources, kids will build leadership skills. 9. HELP POLLINATORS. Kids can join the nationwide effort in tracking bee pollination by taking 15-minute counts of the number and types of bees that buzz around sunflowers and other plants. With data collected from the public, the Great Sunflower Project can determine where pollinator service is strong or weak compared to averages. Native Buzz is another citizen science project created by the University of Florida Honey Bee Research and Extension Lab. Kids can also keep track of their own native buzz nest site and see the results of other participant’s nest sites. Or help pollinators in their own way by building or buying own bee houses, and provide nesting habitats for bees. 10. RESCUE ANIMALS. Conservation non-profits offer summertime youth volunteer programs that introduce students ages 15 to 17 to the importance of volunteerism. By volunteering at the local SPCA or with a marine mammal rescue facility, kids can work alongside adults, develop interpersonal skills, and observe professional scientists.